Toyota’s new sports car based on a platform developed with BMW is nearing completion. 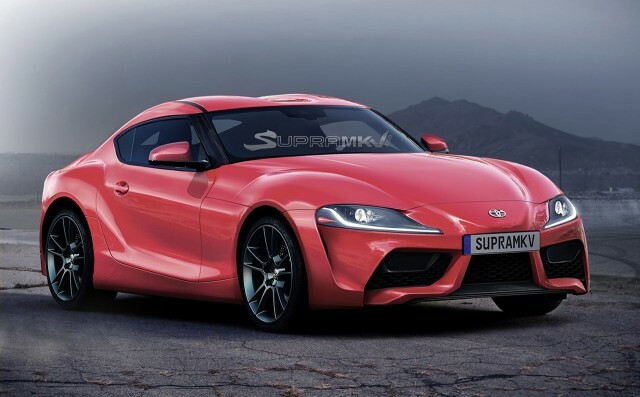 The car, which many predict will revive the Supra name, will reportedly be previewed in concept form during October’s 2017 Tokyo auto show and is likely follow in production trim shortly after. We already brought you a number of spy shots but the SupraMkV forum has some renderings that enable us to look past the heavy camouflage gear of the prototypes and glimpse at the final design. The renderings clearly borrow influences for Toyota’s series of FT-1 concepts, which also preview the new sports car, though in a more indirect manner. Among the cues taken from the concept are the designs for the lights, protruding nose and surface details. No doubt Toyota will have a few surprises in store for the design as well. Unfortunately, the automaker has been very tight regarding details. The car is expected to be offered with more than one powertrain including twin-turbocharged V-6 and hybrid options. We’ve also heard that it will be built alongside its BMW counterpart, the Z4 replacement, at independent vehicle manufacturer Magna Steyr’s plant located in Graz, Austria. Sharing a production facility makes sense considering the low volumes of pricey sports cars. Speaking of price, we’ve also heard that the Toyota sports car will cost more than a Corvette, though hopefully this is only for the more potent powertrain options. Head over to the SupraMkV forum to see the renderings in additional colors.